Welcome to Left Foot Farm! Kidding season is in full swing on our farm! Within the last two weeks we have had 38 beautiful, healthy babies born! 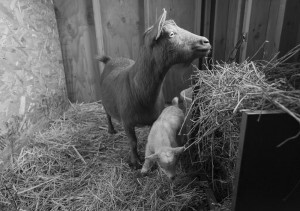 Our mama goats have been amazing throughout the entire process. Remember Dallas and Bunny from our last post? Both mamas had very smooth pregnancies and kiddings! Bunny kidded first on January 12, with one buckling (a baby boy) named Bugs and one doeling (baby girl) named Babs. Both are just as adorable as their mama. Sweet Babs is tan and white- she looks very similar to Bunny. Bugs is mostly white with black markings- he looks like he’s wearing a little black mask around his eyes. Both Ligerian babies were born with the typical small LaMancha ear. Dallas kidded one day later on January 13. Dallas also had one doeling and one buckling named Austin and Odessa. Odessa looks very similar to mom, dark brown with small white markings on her head and tip of tail. Little Austin is brown, tan, and white, and has his mama’s beautiful blue eyes! All four babies are healthy and doing very well! We hope to find wonderful homes for each! Please continue to check back to our website and Facebook page for opportunities to help us bottle feed our many babies in the near future!